Gold Leaf Signage and Glass Gilding (‘verre eglomise’): two classic techniques now making a long awaited comeback. At the turn of the century, gold leaf signage and glass gilding was de riguer – bespoke shops in the UK and abroad had unique, splendid facades. Gold leaf makes an impact no other material can. Gilded numbers add the finishing touch to the front of your home, adding beauty and value. We work individually with clients to choose the best precious leaf, font, size, and colour, creating custom stencils. We provide Photoshop renderings and leaf samples to inform your decision. Metals include classic 23 Karat Gold Leaf, a range of 9-12 Karat White Gold Leaf, and Palladium leaf. Each custom sign is painted and gilded by hand. 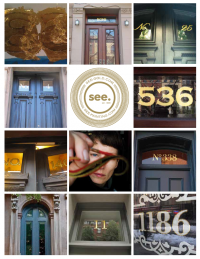 Unlike many modern materials, gold leaf is durable, a sure guarantee that your home or storefront custom gilding will last for decades. Look closely at neighborhoods in London, Paris and New York and you will see examples of signage from the early 1800s! 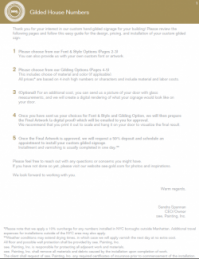 E-mail us at info@see-painting.com for more information or to get a quote for a project!